Build a solar direct pond aerator using cheap solar air pumps and direct current oilless compressors. Note: This instruction guide to building a solar pond aeration system is a guide only. We are specialists in aeration and not specialists in solar power systems. The following list of parts and supplies will enable you to build a cheap solar pond but we are unable to help diagnose or service any solar systems. There is contact information at the bottom of this page if you need help with solar componants. We are providing this information mainly for those of you who are fairly handy with tools and have a basic knowledge of electronics, tools and are able to work on their own at problem solving. I have so many people asking me for directions to build a solar aerator for their pond. It's unbelievable the number of people who have a pond and who want to be able to run a small DC 12 volt air pump or fountain using solar power. The idea is great! Use a small solar panel to run a fountain or air pump to move the water and add precious oxygen and increase the circulation in the pond! The idea is sound but the reality of solar power and building a solar pond are quite different. 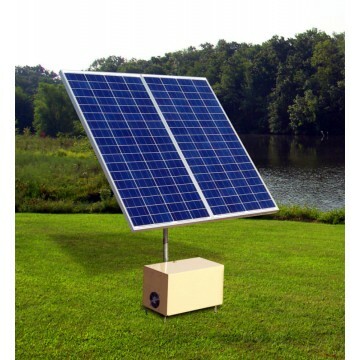 The cost of an effective and reliable solar powered system is many times more than a comparable electric system. Uses no batteries. Provides 0.5 CFM (cubic feet per minute) airflow at 3 PSI. Suitable for small ponds with a maximum depth of 6 feet. Did you read that? Maybe you should read it again? Solar powered aerations systems can cost three and four and five times more than an equivalent electric system. Of course it depends on the cost per kilowatt hour in your state or privince, where I am it is around 12 cents per kw/h, but even at the price of electricity it should be understood that a do it yourself diy solar airiation system will not be cheap as far as the initial purchase goes...but once it's bought you don't pay anything else! !Or do you? DC air pumps will burn out quicker than regular AC air pumps so you can expect to replace your burnt out DC pump maybe every 6 to 18 months..the good thing is is that DC pumps are cheap and you can buy a Thomas DC pump or a SweetH2O pump for between $100 and $500 so the cost of replacing these little beggers isn't too bad! Ok...if you really want to build your own...read on and build your own solar aerator. If you have access to some of the parts then you can just buy what you need and save retail pricing and buy wholesale. KYOCERA solar modules are a reliable, virtually maintenance-free power supply designed to convert sunlight into electricity at the highest possible efficiency. KYOCERA began researching photovoltaics in 1975 and has installed thousands of systems throughout the world since 1978. These systems are ideal for charging storage batteries to power remote homes, recreational vehicles, boats, telecommunications systems and other consumer and commercial applications. KYOCERA's advanced cell-processing technology and automated production facilities produce highly efficient multi-crystal photovoltaic modules. To protect the cells from the most severe environmental conditions, they are encapsulated between a tempered glass cover and an EVA pottant with a PVF back sheet. The entire laminate is installed in an anodized aluminum frame for structural strength and ease of installation. Used to control and power a DC motor from a solar panel. The unit prevents stalling of the motor under less than full sun condition. The power of the sun is transformed to the motor running conditions so as the sun goes down the motor slows down instead of stalling. Conversely, or as the sun comes up the motor starts running much earlier instead of staying stalled for hours when it could be running. This translates into more running time of the motor where it spends a lot of time working instead of stalled doing no work. Unirac Pole Top Mounts for PV Modules Each PV PoleTop™ installation is rated as a full system by UniRac's proprietary engineering analysis software, which factors in rack model number, type and number of PV modules, array tilt angle, and mounting pole characteristics. PV PoleTops are the only poletop line in the PV industry to offer the durability of all-aluminum components. All use installation-friendly SolarMount™ rails for great strength over long spans. Square D outdoor rated load centers can be used for multiple purposes, for wiring that meets the National Electric Code (NEC). Can be used as an AC load center or sub-panel. Not supplied with any breakers. Inline splices are made quickly and easily with the UNITAP line of connectors. UL 486b listed, dual rated AL9CU for any stranded copper or aluminum applications. Rated to 600V and 90° C. Use these insulated terminal bars in place of wire nuts for photovoltaic or other electrical applications. These are often used in DC disconnect switchgear to act as negative busbar and / or to splice in lighting arrestors. Use the 1/2" threaded connectors to provide a waterproof entrance or exit for wiring on PV module junction boxes, outdoor combiner boxes, and junction boxes. Use the 3/4"connector for larger cables up to 5/8"diameter. They are made of Nylon with Buna-N seals and are resistant to salt water, weak acids, weak alkalis, alcohol, ether, esters, ketones, and mineral, animal and vegetable oils. The threads are 1/2"or 3/4"NPT. Non-corrosive and suitable for direct burial installations. The two-hole 1/2"connector is designed for use with two #10 or #12 type USE conductors like the ones used for MultiContact PV output cables. UL listed. Suitable for use in NEMA 4, 6 and 12 applications. Locknuts not included. Fork tongue design. Faster installation - screw needs only to be loosened for termination. QO circuit breakers snap into QO load centers and are designed for surface mounting. They are UL listed for DC branch circuits up to 48 VDC (not for use in 48V systems). They can also be used for 120VAC (1-pole) circuits. They can handle one or two #14 to #10 wires or one #8 wire.